For me it seems that the annual Spiel convention in Essen, Germany is as much a muse when it comes to game design as reference books, documentary films and random life-events, e.g., just hearing the name of String Railway in 2010 led to a kooky and successful twist for me – Paperclip Railways – in 2011 (as previously detailed on BGGN). That's not unique, however, as the poor people who have heard me bang on about Colon (lots of colored cubes converted to brown cubes) or Bazelgette will attest. In this instance, consulting the dates on some of my archived Word documents and graphics files, Snowdonia's origins stretch far back to the mists of Spiel 2006 (gasp!). Surprised Stare Games was a hungry fledgling with its third product and first board game – Tara, Seat of Kings – freshly minted; it sold in pleasing numbers and came fourth in the Fairplay poll of that year's show. What little time we had before each very busy day usually involved a coffee and some banter. Specifically, I recall a discussion about railway games and how we would approach the theme should the occasion arise. Always keen to put an alternate twist on a genre, I jokingly suggested players wouldn't build a full network of rails or invest in shares, but instead work together to build just the one line – and I mean properly build it, i.e., dig, lift, strain, wheeze and struggle. (Could one sculpt a meeple with a hernia?) Paramount in my idea was to avoid the usual top-hatted, stock market wheeler-dealering; not for us the cube-shipper mechanism or the cardboard hexagonal piece! Having to quickly justify this nonsense with an example, I pulled "Snowdon Mountain Railway" out of my neural net and the conversation came to an "Oh, Tony!" exasperated halt. 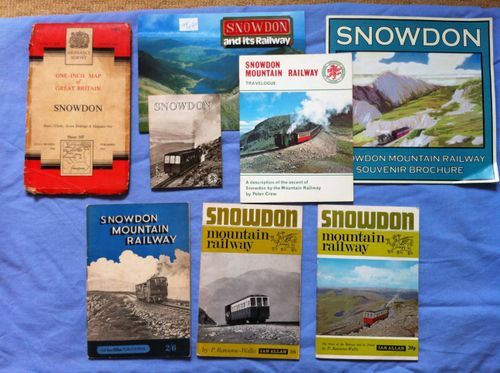 Those initial files contained the tentative results of some follow-on research: web-sourced historical nuggets such as the dates of the Snowdon railway's construction, the landmarks and stations along the track (with height above sea level), the names of the first locomotives, etc. 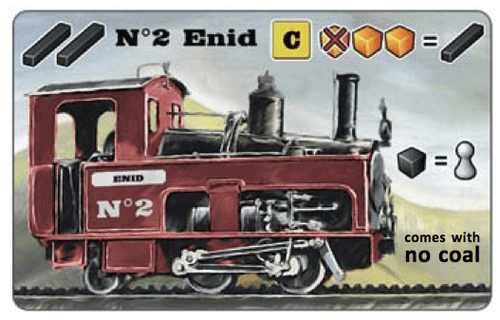 Nugget: The game uses the trains to lend theme to the concept of bonus-bestowing artifacts even though only the first two – L.A.D.A.S. and Enid – were actually around-and-about the site during construction! 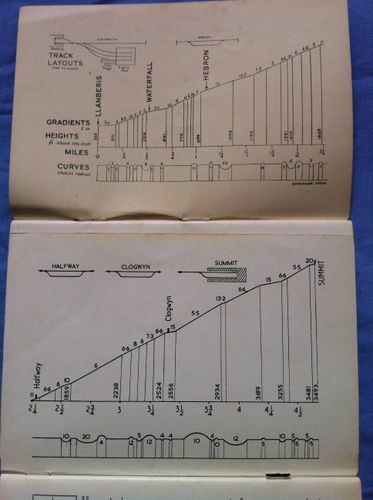 This online research was supplemented by my chance spying of a 1960s Snowdon Mountain Railway guidebook which contained a full history of the whole construction with archive photos, route descriptions, and (for the obsessive) tables of chain distances, gradients and altitudes. There was an auction house (forerunner of the Stock Yard) in which players bid for "lots" of materials and bonus cards; the "everything comes out of the bag" was there, too, as only contract cards were bought by taking "contract cubes" and there was no concept yet of integrated weather or events. 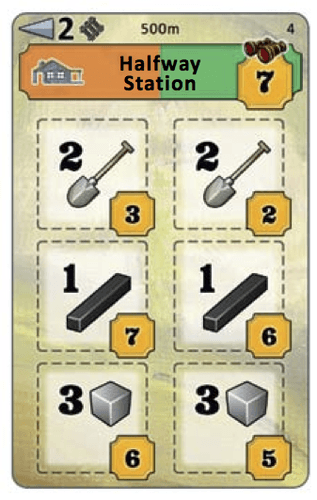 Building contracts also had a countdown-style "time to build" mechanism (using a d6), so you had anywhere between three and six turns to collect and convert all the required resources to fulfill them! TBH they were bloody tedious to manage; lots of checking and re-checking and counting dice-pips down each round. There was also a penalty for players who failed to complete their contracts on time – even more paragraphs of rules, admin and general messing-about. It didn't take long for them to hit the recycle bin! From the ashes of this complexity came the simpler idea of the Stations – the same basic idea of "packets of work" that needed doing but without all that money-counting, dice-adjusting nonsense. In this final state of design, a Station is made up of X bits of work that need doing: digging (the excavate action) and/or building (the build action), with the latter needing steel bars or stone. Players can do as many or as few of these spaces between themselves, with the game's event mechanism filling in the gaps! The central board started as a hex-based railway line – that also needed building – which looped around its quarters, along with the scoring track. A scoring phase was triggered when each quarter was complete. At this point, the action spaces were a set of cards laid out along the top edge. The idea of miniature scoring phases persisted for most of the development period (albeit reduced from four to two), but interestingly (to me) even a five-minute hiatus to total things up halfway through the game interrupted the flow of play too much. The second half always played quicker than the first anyway – people now had resources, trains, a direction, etc. – so the design naturally evolved into play-score-finish. This also eliminated the need for a scoring track, which is always problematic when peeps reach over to place meeples, gather resources, etc. Also, it didn't take long to reverse the layout and have actions on board and the railway around the outside. This approach also opens up design space for alternative scenarios, i.e., the game becomes a system. 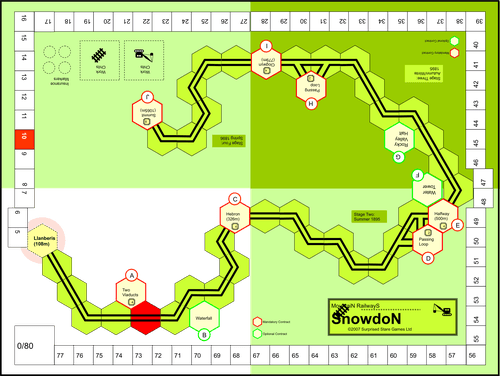 Thus Snowdonia as it will appear in October 2012 when first released comes with the Snowdon Mountain and Blaenau Ffestiniog scenarios – but I also have prototypes for Jungfrau (dynamite! ), Darjeeling & Himalaya (tea!) and a funicular railway in Aberystwyth (very small indeed). All of these scenarios use the core game in differing (and, hopefully, interesting) ways. It was in 2010 that the final incarnation of Snowdonia took shape. I threw all of my printed bits away and laid everything out afresh – a shiny, slate-wiping exercise with new board, all new cards, new wooden pieces, and so on. I think the ingenious graphic design of Le Havre inspired me to boil down the components for Snowdonia into the tight, double-sided and no-space-wasted system it now employs. Why have cards with branded backs when you could make use of that second side in game? The 2010 version (then code-named "Mountain Railway") is, at its core, the version surviving today; what needed shaping at that point were the Events (the white cubes in the resource bag) and that all-important weather. The Events were a simple exercise in "how many cubes do I want?" I had long settled on the idea of Events coming out with the other resources. Events keep the game moving (and down to its pocket-sized playing time), but if you have too many, everything is done before you've started, and having too few leads to stagnation (and too much time for players). Combine slow Events with bad weather and you really did feel like you were suffering for your constructive art! Balancing that magic number was difficult – four-and-a-half would've been best – but I'm happy with the element of urgency these cubes now inject: If the players hoard or dawdle, the game will complete itself! The weather was always designed to adjust a work rate track, but how to do so was probably the most frustrating part of the whole development. I tried a custom colored-face die roll, then a regular die roll consulting a weather table – but die rolls are random in a special annoying way all their own. More importantly, both methods still gave you weather only for the next immediate round. 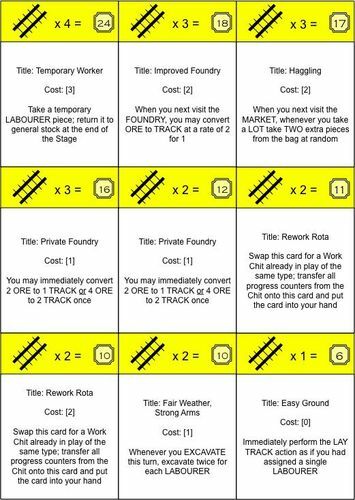 Wanting to let players plan against/with the weather in advance, I moved to a miniature deck of pre-set weather forecasts. 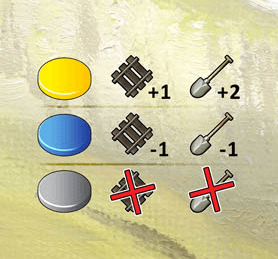 This introduced the idea of "this round and the next two rounds" – but with presets, I felt the pendulum had swung from "too random" to "too prescribed". It was a chance comment from Alan Paull at a game development day about the Contract cards that solved the problem almost immediately: Use the back of those cards while they're still in the draw deck as the generation system. It was but a matter of moments to establish the proportions of rain, sun and fog across the thirty-card deck and to ensure (in case discarded cards needed to be re-shuffled and re-used) that all the perceived "powerful" cards had terrible weather on the back. With the cards being refreshed, to some extent, every round this eliminated a component (the die), simplified the mechanism, and facilitated a weather forecast that would enable planning. Pretty much the whole of 2011 – bar a few distracted months spewing out Paperclip Railways – was spent crafting the Snowdonia prototype, balancing card powers and scoring values, checking the action spaces for the different player configurations, tweaking the Event track (what happened and in which order), and pricing the trains. The Surveyor action (walk a man up the mountain for increasing VPs) came out of this period, when certain players felt they needed "a sort of pass action but NOT a pass action". (I'm looking at YOU, Mr. Richard Breese.). This new space also introduced the alternative build rule idea that lead to the Blaenau Ffestiniog scenario! In January 2012, I was sitting in my library – yes, I have a room wholly devoted to books and games! – scanning the shelves absent-mindedly when my gaze fixed upon Walnut Grove (which I like very much). It sparked a mad idea: Snowdonia has a lot in common with the Lookout Games house style, so why not see if they'd be interested in it? I Geekmail-ed Hanno Girke "on the off-chance"; after all, the worst he could say was a polite "no thanks"! It turns out that North Wales, and the Snowdonia region in particular, is one of his favorite places in the world to be; thus, he was naturally predisposed to being interested. That same day, I sent my only prototype to Germany and crossed everything in anticipation! 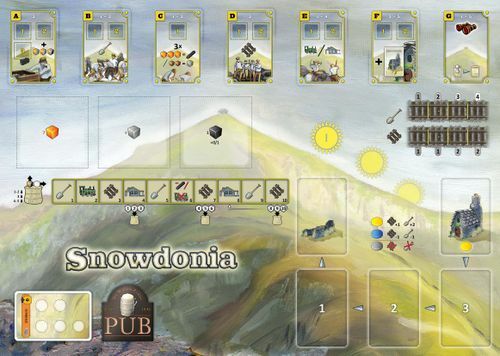 Aside: Throughout Snowdonia's development, I had a nominally spec-ed out two-player variant, but never got round to paying more than a derisory interest in it as playtests always involved at least three. I paid it no mind. A fortnight or so after I had sent the whole shebang off to Lookout Games for evaluation, Hanno's first comments came back with a disturbing introduction: "We just finished our first game - 2 player." Oh, sweet cheeses, no! This wasn't supposed to happen; I've not tested it at that level. I was deeply depressed; my chance for a good first impression seemed to have crashed and burned. He wrote: "First of all - I think it's a great game. Still - the 2p version needs some more spading. ;-)" - at least he was making puns, so there was light at the end of this tunnel! He added: "2-player is really important...it's the 'play-with-the-wife aspect'." Hanno's early e-mails also suggested "a solitaire version", which of course shouldn't have been a surprise given Lookout's 1+ preoccupation. He continued: "It makes the game easier to learn if you can walk up the mountain all on your own and then chase your own high score." I don't play many solo games myself, but having entered "enthusiastic design mode" for the two-player game, I ran the one-player project in parallel. In the end, it's the same as the other variants except that you cycle through a series of games with a different starting train, fewer cubes in the bag, and quicker "churn" through the contract cards! It is satisfying to find that, after the flurry of work in February and March 2012, the heart of Snowdonia proved resilient and true with just the fine edges being honed. Those two months belie, of course, the five years of effort herein described to get it into that "reviewable" state. 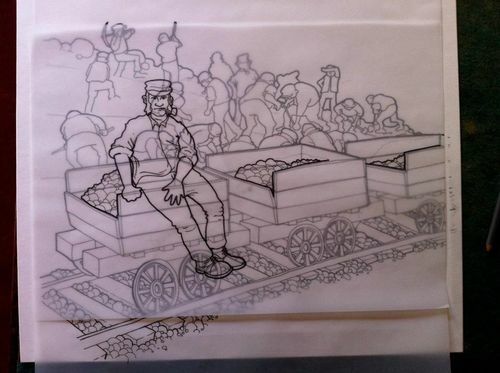 Since April 2012, Snowdonia has been a flurry of graphic work (sketches, line art, "coloring in", final layouts), firstly for showing off at the UK Games Expo, then as part of the final production. Dealing with, and to a great extent being guided by, Hanno and Klemens Franz at Lookout has been an absolute pleasure; their positivity and professionalism have made the whole experience an absolute joy. I feel this is wholly reflected in the quality of the final product, which is tantalizingly close to being in my hands! was posed for by my middle son Benedict on the edge of the kitchen table.